I’ve been reading, with greater and lesser pleasure, Karl Ove Knausgaard’s My Struggle, which–throughout the series of fictionalized memoirs–has repeated references to Romanticism, especially in painting. In the narrative, he’s regularly moved by images that convey the implacability of nature–and these moments, not of epiphany, but of emotional release, baffle him because the author has no way of making sense of his deep response to nature through these paintings, in contrast to his almost Beckett-like exhaustion with the daily life he so tediously represents in thousands of pages of prose. My response to the series of books is similar to my reaction when I look at artwork created in devotion to an invariable idea–in other words, a fair amount of work done over the past 150 years–once you grasp the idea, if it’s merely the illustration of an idea, why keep reading or looking? What’s fascinated me about Knausgaard is his deep ambivalence about modernism and the way it has set ordinary human emotions aside in favor of general artistic principles (though his own artistic principles seem, in the course of the work, to be destroying his own family so that maybe has more in common than he thinks with the modernism he distrusts). Hence, his retreat, emotionally, to Romanticism. Yet, in the final volume he seems to see his florid outpouring of feeling in reaction to certain poetry and painting as delusional, or at least negligible–leaving the reader with a vision of his creative work as a pointless exercise in obsessive attention to his own life, out of a conviction that life is essentially meaningless. Not exactly where I had though he might be going. 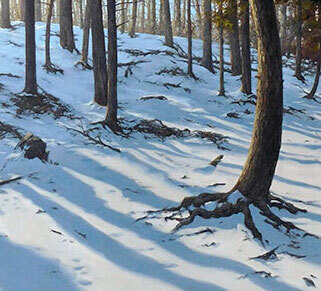 Three artists on view now at Oxford Gallery are equally drawn to the beauty and grandeur of nature–Ken Townsend, Charles Houseman, and Sean Wituck–and don’t quite distrust their passion the way Knausgaard does. And there’s an appreciative realism involved here, a friendly humility in the face of nature, that seems more contemporary than the era evoked by the quote from Wordsworth Jim Hall has used for the show’s title. Their work hints back to the Romantic love for nature, but not in a way that evokes the Hudson River School, nor the sublime of Edwin Burke or Kant, where nature is great beyond comprehension. Turner’s storms are nowhere to be found here. Nature is beautiful in their paintings, and in some cases, as indifferent to human comfort and scale as it is in the Romantics, but it’s also still, inviting, and serene–a setting for human purposes, on its own terms. The painting that most interests me is what appears to be a diptych depicting a spot on the coast of Maine, at Acadia National Park by Houseman–enormous rocks, typical of Maine’s fractal coast line of glacial rock. The massive boulders at the center are surrounded by tidal pools covered with a thin layer of autumn leaves–the leaves are what make it inviting. It’s a glimpse of an outcropping that could serve as a seat for a hiker’s quick lunch in October, or could just as easily be what was visible twenty thousand years ago, when cave paintings were the only contemporary art. I suppose that’s a roundabout way to say the current show at Oxford offers a glimpse of what’s timeless everywhere around us, with a hint that our time is brief, compared to the tenure of sky, earth, ocean and trees. Maybe that’s a Romantic insight after all. You are currently browsing the represent weblog archives for the day Friday, February 1st, 2019.